"What don't KILL YA makes ya more strong!" sang frontman James Hetfield during Metallica's pummeling metal avalanche in Portland. Older, wiser and returning from the edge of near-implosion with their new song cycle Death Magnetic, the leonine singer, drummer Lars Ulrich, axeman Kirk Hammett and bassist Rob Trujillo summoned the thunder and rode the lightning for two merciless hours. While deafening ovations and arena-wide, synchronized fist-pumping were the norm, you can mainly credit timeless, male adolescent angst and Metallica's mere presence for that. Metallica, three decades in, is a tad predictable, especially for longtime fans. The guitars? Thrashing and speedy. The drums? Precise and insistent. The amps? Loud. The bass player? Inaudible. The surprises of today's Metallica mainly reside in eye-popping stage effects (the dancing lasers and multi-hued flames were undeniably impressive) and their well-advised dusting off of deep cuts in concert. After opening with the hell-bound speed-coaster of Death Magnetic's "That Was Just Your Life," the band leapt right into the spiraling grind of "The End of the Line." Clearly, finality is on Metallica's mind these days. With a resurrection like the one they experienced after their near-breakup and almost universally despised last record, St. Anger , it's no wonder. With a building full of forgiving, cross-generational fans fueling them, the metal legends thrashed away at songs both dusty and shiny, giving the house a fairly representative sampling of their songbook. Shockingly, only a single song from consensus favorite album Master of Puppets was performed (the title cut), but their previous effort Ride The Lightning was mined repeatedly with the truly unexpected title track, the ominous "For Whom the Bell Tolls" and the vicious yet most welcome "Fight Fire with Fire," which boasted the evening's most spectacular flame effects. Throughout, Hetfield was in strong voice and displayed remarkable energy, headbanging and stomping about the in-the-round stage. Ulrich was metronomic in his drumming, reliable yet less spectacular to watch than when he was a seemingly eight-armed younger man. 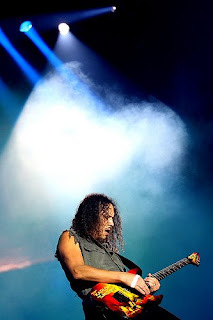 Meanwhile, Hammett and Trujillo were on point, plucking and slashing through riff-bombs like "No Remorse," "Sad But True," the latest single "The Day That Never Comes" and, at the encore, the covers "Last Caress" and "Stone Cold Crazy." Three decades on, and a shoo-in for a Rock And Roll Hall of Fame induction next year, Metallica may be broken, beat and scarred, to paraphrase one of their new tunes, but they die hard. Opening this major concussion of an evening was The Sword, a gang of longhairs that offered a fleet, hair-toss-worthy brand of thrash that recalled early Metallica. After The Sword was run through the Rose Garden, the quite intimidating Down, fronted by ex-Pantera singer Phil Anselmo, offered a slower, sludgier brand of metal that gradually won the crowd over, big time. It didn't hurt that Pantera's bass player was also onstage, nor that a tribute to the defunct band's late Dimebag Darrell was included. Perhaps the most striking thing about Down's set was Anselmo's very noticeable evolution from Pantera's drunk, belligerent junkie to what looked to be a clean-cut, thinner Glenn Danzig. The deep-voiced menace, while still a badass, now exudes a gracious, humble bearing towards his fans, bowing down to them and applauding them throughout the show. Who says metal is a dead-end road? If Anselmo has a new lease on life, there's hope for us all.